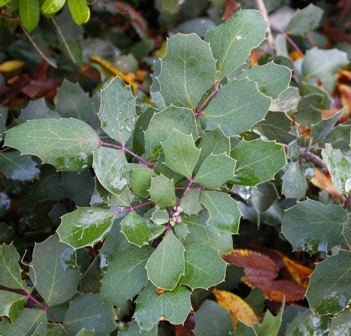 Joy Creek Photo Archive (c) all rights reserved Mahonia repens is an especially blue-foliaged selection of our NW native woodland groundcover. Its evergreen, thick, holly-like foliage is always attractive, but never more so than when it is in bloom with complementary yellow flowers. Later blue-black fruits offer a more subtle contrast. A Great Plant Picks selection. Mid- to late spring. 12 in. x 3 ft.